Piper is deaf, having started losing her hearing at 6 she’s had the same barbie pink hearing aids for over ten years because her parents couldn’t afford new ones, especially after they moved to a nicer area of Seattle, with higher real estate prices just so she could get into a school with a good deaf programme. The deaf programme is cancelled, her dad loses his job and her sister is born completely deaf. AT 18 months Grace is fitted with an implant which restores hearing, then Piper learns that its her college fund that paid for the implant and she has to restore it… Enter Dumb, the college band that have just won Seattle Battle of the Band. They need a manager and somehow, Piper is it. She’s in it for the money, but is the band worth it when she’s got to deal with a pretty boy jerk, a talentless piece of eye candy, a silent type bassist, a guitarist who’s ready to rip someone to pieces and the boy who has been crushing on her forever, without her knowledge? I have had Five Flavors of Dumb sat on my shelf for almost year now. I first saw a review of it over at Ashley’s blog, Books from Bleh to Basically Amazing, and knew I needed to read it, however I bought it and somehow it got pushed to one side. I was in the mood for a great musical themed contemp though and decided it was about time to give it a go, and now I’m kicking myself for leaving it so long. The story is great, Theres a lot going on in Piper’s life that she has lost control over, there are problems at home with her dad losing his job and her sister needing an implant so that she can hear, not to mention her parents raiding her college fund for said implant, her mum working all hours just so they get some extra money and her dad refusing to learn how to sign, even after all these years. Even her brother, Finn, seems to have turned his back on her and is becoming more and more rebellious, looking like all he wants is a one way ticket out of high school. So when she sticks her nose into the band and their problems she really doesn’t understand how it gets her the job of manager, but she needs the money and thinks she can do something to help them so goes in full throttle. The bands starts out as a three piece, with singer, bassist and guitarist but once Piper’s friend helps them out with the beat its apparent that they need a drummer and he’s it. Then, as Josh the main singer fancies her, Kallie is added to the group, she appears to be little more than a pretty face and as one of the most popular girls in school its clear that shes there for one reason, Josh. The story continues and it’s clear that Piper bit off more than she could chew as the band know three songs, which are all covers and three chords, which won’t get them far. The mission is to get them a paid gig but to do that Piper has to become a little more extrovert than she’s used to. I really loved the progress of the band and all the characters, mentioned above really is a summary of what goes on and there’s so much more to it than that. Each and every one of the band members, including Piper herself, go through a transition in the book and its an incredible thing to witness. Tash isn’t as mean as the green spiked hair would come across and she softens enough within the book to still be the same character but to be loveable. Kallie isn’t as self centred as you’d expect and has her own issues. Its clear to the reader that Ed has such a crush on Piper but she doesn’t pick up on it and thats brilliant to watch, Josh is a prick purer and simple and Will, well he’s the silent type and you don’t see his strength until late on but you can always tell its there. As well as the band you get an insight into Piper’s parents and their issues, including Piper’s dads love of music that he has had to quash to become a ‘respectable father’ and her mothers conflict with not being there as much as she should be for her kids. Piper’s brother Finn plays a huge role too and I really loved him for everything he does for Piper. I really hated Piper’s father at first but his development in the book is eye-opening and by the end I wanted to kiss and cuddle him! Other minor characters in the book make it incredible too with Baz, the strange ex felony studio manager and Mr Belson, the math teacher and chess club organiser who fails to believe Finn and Piper can be related when they are so different and wants Finn on detention from the minute he first sees him! Marissa also makes for a really interesting story within the overall book and I really liked what happened with her and Piper’s friendship, although it was a little sad at times I liked what it signified and how it panned out. I really can’t fault this book at all, I loved every second of it with the lessons about love, friendship, music and taking control of your life. Piper’s deafness caused major problems with her but a bit of the story was about how she had learnt to live with it but the people around her still had problems with it. It opened my eyes about how difficult it must be for her and how living with reduced hearing had made her a stronger person. I loved Piper’s changes and the way she opens up to the world as the book goes on and the relationships she builds up in it. There were a couple of things I saw coming, mainly with Ed and Kallie, but they can easily be forgiven because of the brilliant story, character development and smooth simple writing which makes the book a fun easy read that picks up on the everyday problems of high school seniors. I honestly couldn’t recommend this book more! 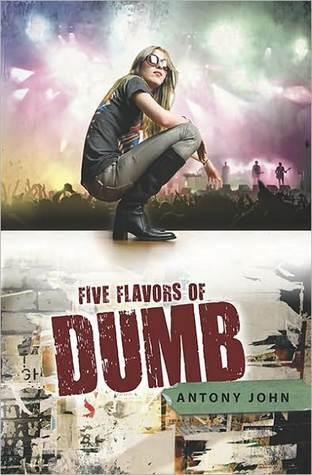 Five Flavors of Dumb was published in September 2011 by Speak, an imprint of Penguin US. My copy was purchased via amazon. Not a book that I’ve heard much about but it sounds fantastic! I’ve not heard of this book before but I’ll keep an eye out for it cos it sounds great! I have heard SO MUCH about this! It looks soooo good, especially the music part. I think I need a copy, like, right now! Great review, Raimy!